The cost of doing business in Western Australia has long been a rhetoric heard and discussed throughout the state, with increased economic activity in recent times exacerbating the issue. The geography of the state, with its capital – Perth, one of the most isolated cities on earth, together with the majority of its land area classified as ‘remote’ or ‘very remote’ can add to cost pressures, making business operations more challenging than might otherwise be the case. 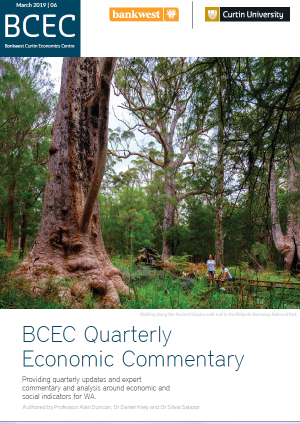 The Cost of Doing Business in WA is the fourth report in the BCEC Focus on Western Australia series. It addresses an issue of central importance to Western Australia in maintaining its economic growth story – the costs of doing business in the State. The question of whether the cost of doing business in Western Australia is more or less expensive compared to other states and territories and whether business input costs have been rising disproportionately over time, is largely a relative one. Much like the question of whether the cost of living has increased – it depends to a large extent on the means one has. Excessively high business costs can hamper growth and productivity, making it difficult for existing and incumbent firms to realise their full potential. A number of WA business input costs have been increasing over time and are high compared to other Australian jurisdictions. However, WA business revenues have also been increasing at a faster rate than other states and territories. Is the cost of doing business in Western Australia problematic? For some businesses and in certain regions and industries – yes. Small to medium businesses, those operating in remote or regional areas and those reliant on inputs that have seen the biggest price increases are among these. For other businesses, cost pressures are for the most part a product of increased demand, fuelled by strong industry-specific economic growth. Continued microeconomic reform that focuses on taxation and industry specific issues will help to ease cost pressures for many business in the West, ensuring that the state builds on previous growth and has the ability to diversify and compete in a global market.